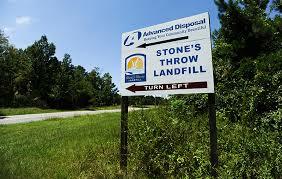 The Stones Throw Sanitary Landfill began accepting waste in 2002 under the ownership of Stones Throw Landfill LLC, a subsidiary of Advanced Disposal Services LLC. Currently the landfill receives approximately 232,000 metric tons of waste each year and is designed to remain active through 2025. The landfill has never had a Notice of Violation (NOV) since opening, but it has wanted to eliminate the greenhouse gas impact of methane from the site. In 2006, Stones Throw initiated development on Phase 1 of a landfill methane gas collection and destruction system. This system includes vertical and horizontal gas wells, collection laterals, a blower, and a flare to combust the gas. In April 2010, the project became operational and applied as an offset project to the Climate Action Reserve (CAR). A second phase, to make beneficial use of the gas for electric generation, is under study. Stones Throw’s methane capture and destruction project was approved by CAR in 2010, and it is expected to eliminate methane emissions equivalent to 261,000 metric tons of CO2 over the next 5 years. This project collects and destroys landfill gas otherwise emitted from the landfill. Landfill gas includes methane, a major greenhouse gas. Municipal solid waste landfills are the second largest source of human-related methane emissions in the United States, accounting for approximately 23 percent of these emissions in 2007. Collection of the landfill gas typically reduces odors associated with the gas. The collected gas will provide a future opportunity to make beneficial use of the gas for electric generation, creating further environmental benefits to the community through the displacement of fossil-fuel power generation on the grid. There are no significant negative impacts. The project will require the use of equipment that consumes electrical energy, however, the amount of this energy and its associated environmental impacts are expected to be minimal in comparison to the overall environmental benefits of the project. The Stones Throw Landfill methane abatement project meets CAR Landfill Project Protocol 3.0, and the 2010 vintage CRTs were verified by independent third parties in the first quarter of 2011. The landfill is not required to control methane emissions and it is installing the collection system solely on a voluntary basis. The project includes a collection system and flare only, and it currently does not incorporate electric generation. The only revenues to offset the capital and operating costs of the collection system are those received from the sale of carbon.